Wacoal has officially opened its second free-standing boutique in Malaysia! The new boutique is located on the upper ground floor of Empire Shopping Gallery, Subang Jaya. At Wacoal The Store, generations of ladies from a family can pick through meticulously chosen merchandise in the privacy of the over 1,000 square feet boutique with a fresh, contemporary interior. Exceptional products amid the cosy and intimate ambience - ranging from the darling Wacoal Gold collection, the body-shapping goddess Magic X to the USA imported sweetheart b'tempt'd (short form for 'be tempted' - are set to cater to ladies of all ages. 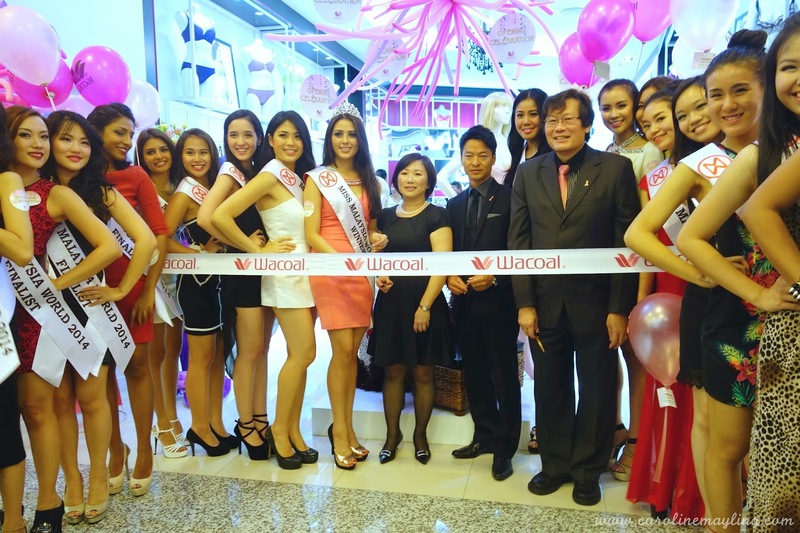 During the official opening, Mr Takashi Watanabe, the Executive Director of Wacoal Malaysia said the well-trained Beauty Advisors at Wacoal The Store will aim at generating a sensory experience for ladies and recommend lingerie of specific design or feature that best suit a customer's needs through consultation. Fellow guests were given an exclusive glimpse of the 20 finalists of Miss World Malaysia 2014. In conjunction with the occasion, many in-store promotions await Wacoal fans and ladies alike throughout the month of August.